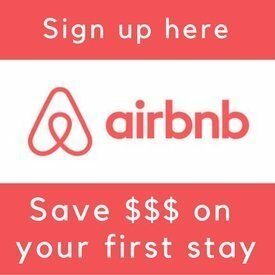 I grew up in New Zealand and was always looking for free things to do in Auckland. From nature hikes to museums to contemporary art, here are a few of my favorites. Auckland has one of the most beautiful harbours in the world so make the most of it and spend some time on the waterfront. There are gorgeous views of Rangitoto Island from many vantage points on the Auckland and North Shore waterfronts. I love to stroll along the boardwalk between Mission Bay and St Heliers’ Bay. 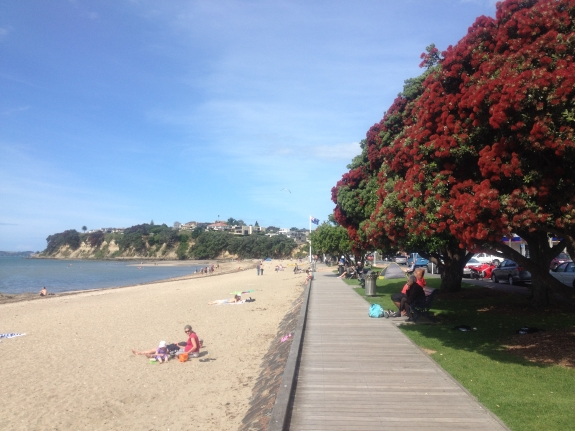 In December New Zealand’s official “Christmas tree”, the Pohutukawa, is in bloom and the waterfront is glorious. Catch the 750 or 769 bus from the Britomart Transport Hub along the waterfront (Tamaki Drive) to Mission Bay or further on to St Heliers. Cost to St Heliers NZ$4.50. If you get off the bus at Mission Bay you can walk up to the Michael Joseph Savage Memorial Park for breathtaking views of the Rangitoto Island and the Harbour. For those who have a rental car, 35 minutes west of downtown Auckland you will find a beautiful New Zealand native forest with mature Kauri trees. There are many bush walks that vary from 10 mins to several hours and it is all free. I recommend the Auckland City (loop) Walk which takes about an hour. It lies at the end of Falls Rd, past the golf course. 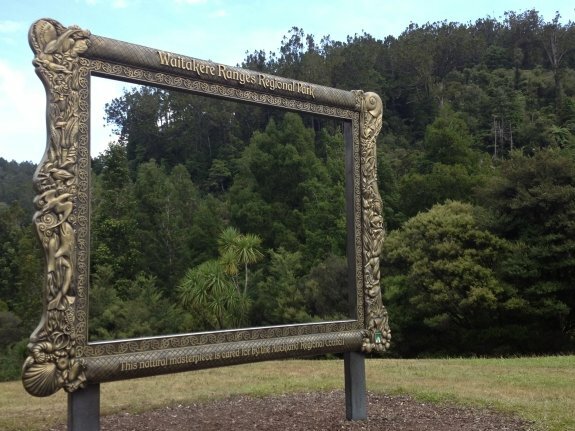 To get to the Waitakere Ranges from downtown Auckland, take the North-Western Motorway and get off at Swanson Rd and continue onto Scenic Drive. If you want to do the Auckland City Walk, turn right from Scenic Drive into Te Henga Rd and then left onto Falls Rd. Pick up a free brochure, which include maps, about the Waitakares at the airport when you arrive. 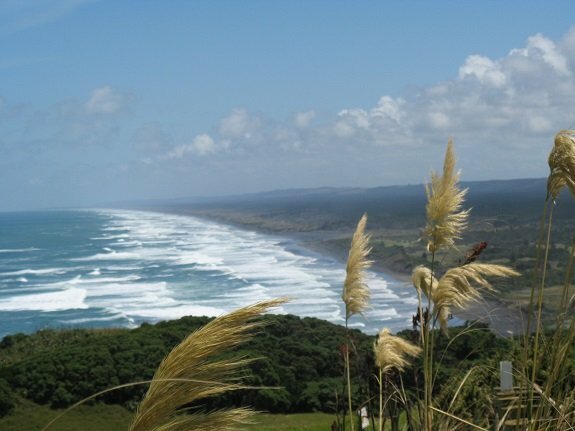 A little further north of the Waitakere Ranges are the West Coast beaches Muriwai, Bethells and Piha. Popular with surfers and those that love to stroll along long stretches beach between the thundering surf and the sand dunes. West Coast beaches are famous for their black sand. 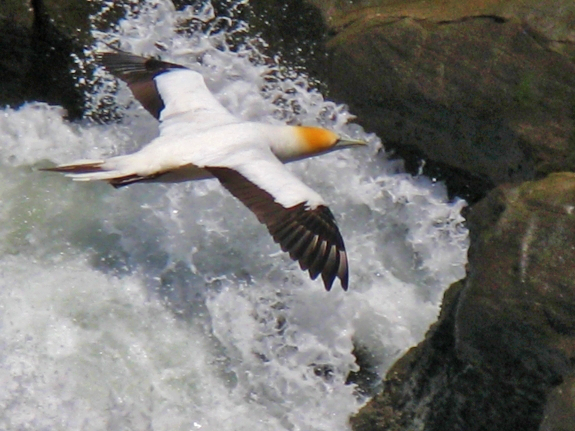 At the south end of Muriwai beach is the Gannet (bird) Colony; the best time to visit is between October and February. Adult pairs return to this spot each year to nest. The chicks hatch in November and fly off to Australia 15 weeks later. There are brilliant views of the main colony from the view platform and I love to watch the adult Gannets soaring on the on-shore winds. It takes 40 minutes to drive the 45 km from downtown Auckland to Muriwai Regional Park. Follow State Highway 16 until you get to Waimauku and then turn left into Muriwai Rd and continue to the park. 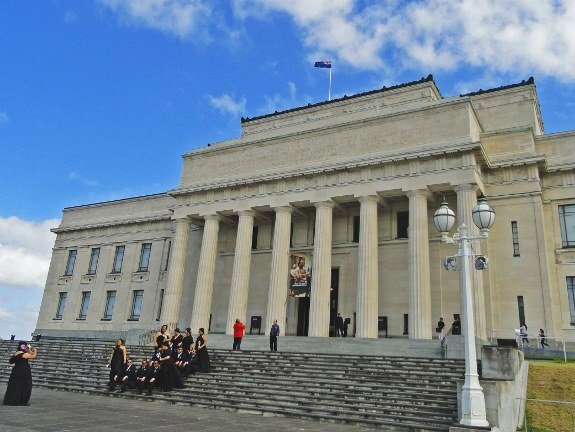 One of the most impressive buildings in New Zealand is the Auckland War Memorial Museum which sits atop a small hill in the Auckland Domain (that’s a park for you non-Kiwis) and offers impressive views of the city and harbour. Despite the name, most of the the museum is not war related. Admission is by voluntary donation. To use the bus to get to the museum, take the bright green “Inner Link” bus which does a circuit (both clockwise and anticlockwise) around inner city Auckland and costs a maximum $1.9 per ride. Hop off at the bus at 470 Parnell Rd. Take the first right turn and walk down Domain Drive and you will see the Auckland Museum on your left. If you remain on the green bus you will travel through the popular New Market shopping area, back around past the Domain, up Karangahape Rd to Ponsonby (which is famous for its cafes) and down past Victoria Park to Customs St in the central business district. The buses run every 10-15 mins. New Zealand has produced some very talented artists. 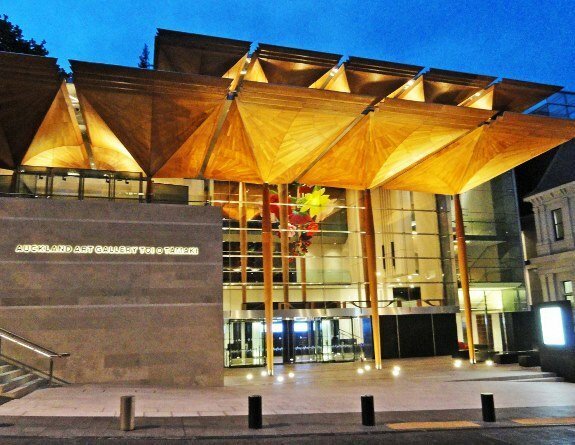 Many examples of their work are contained within The Auckland Art Gallery. One of my favourite artists is Charles F. Goldie who painted amazing portraits of the Maori, NZ’s indigenous people. The museum is housed in a traditional Edwardian building but just added the recent Maori inspired wing seen above. 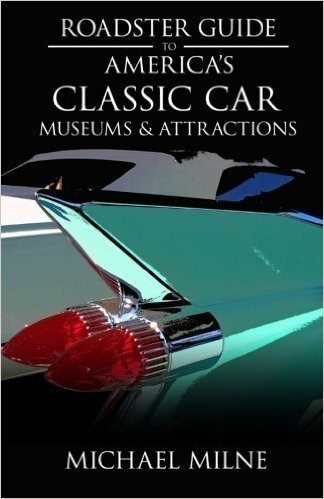 Admission to the gallery is free but charges apply for special exhibitions. How to get there? From the bottom of Queen St you could walk or catch the bus up Queens St until you get to Wellesley St East. Walk 1 minute up Wellesley St East and you will come to the Auckland Art Gallery on the corner of Wellesley and Kitchener Streets. 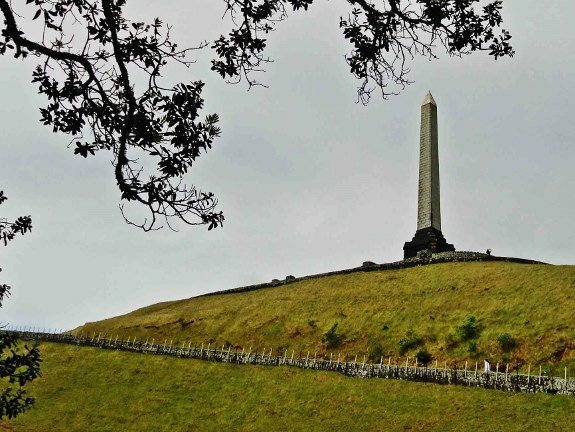 The site made famous in a U2 song, One Tree Hill offers the best panoramic view of the Auckland area. Try to count the 48 (hopefully) extinct volcanoes in this volatile region. One Tree Hill has a history of its own related to conflicts between the Maori and later settlers. You can read more about that at: Why there is no tree on One Tree Hill. 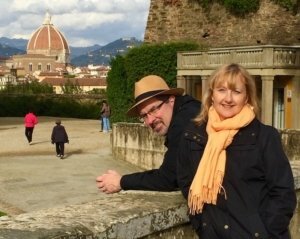 Guest writer Kathryn grew up in Auckland. 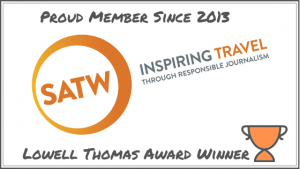 She’s embarking on an open-ended global journey in May 2013 and blogs at RTW Travel Guide . Previous post: Is dulce de leche the best flavor in the world?